Everybody needs to move their bowels, the more often the better of course. 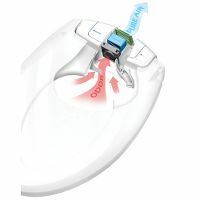 Unfortunately for those who live with rather large families, the chances of walking in on a toilet that has been freshly “bombed” by a log deposit is much higher than having just a couple of heads under one roof, which is why there are devices like the Automatic Deodorizing Toilet Seat to reduce embarrassment. This is the toilet seat that immediately suppresses bathroom odors by deodorizing the ambient air. As you sit on the seat, a whisper-quiet fan passes air through a replaceable carbon filter that absorbs odors, and is then freshened with one of two included fragrance modules, infused with pleasing, natural extracts, including Jasmine/Lavender and Citrus/Eucalyptus. The carbon filter deodorizes for six months and the fragrance module freshens for one month. Seat is made of durable, anti-microbial polypropylene. Requires two D batteries for nine months of use. Elongated comfort seat. Sounds like a dream addition to any home, but the $129.95 price point might make one pause and reconsider. Hopefully it will be waterproof as well, since many Asian countries feature a toilet and a bath that are attached in a single room, hence showering will normally wet the toilet seat as well. CGOTW Time, What Gadget is Coolest?